The medical team was travelling to a health camp. The horrific incident took place in Murshidabad district, 250 km from Kolkata. Locals managed to rescue one person alive from the burning ambulance in West Bengal's Murshidabad. 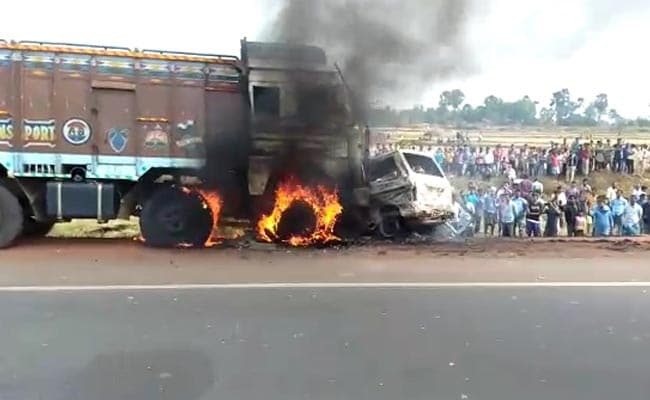 Four people were burnt alive this afternoon when a truck rammed their ambulance and it burst into flames in West Bengal. The people killed were two doctors, a nurse and a pharmacist, travelling to a health camp nearby. The incident took place in Murshidabad district, 250 km from Kolkata. There were no patients in the ambulance. While locals managed to rescue a man from the burning ambulance, they couldn't pull out the others who died of injuries. Police are looking for the driver of the truck and his helper who fled the spot. The Berhampore-bound truck rammed the ambulance while overtaking another vehicle on National Highway 34. Images showed by-standers watching helplessly as the ambulance was crushed by the truck. The man who has been rescued is in hospital in a critical condition. The medical team worked at a private hospital in the district. "I was waiting for the medical party since 9 AM, patients were becoming restless because of the delay in arrival. I located them via GPS and came to see why they were stuck. By that time, everything was over," said Souvik Sheikh, the manager at the health camp in Samhatinagar.